Mirabeau is currently experimenting with various cognitive services like text-, speech-, and image recognition. We believe that A.I. will have an even bigger impact in our lives than the smart phone revolution has. This research should lead to real world experience and examples for various A.I. services. 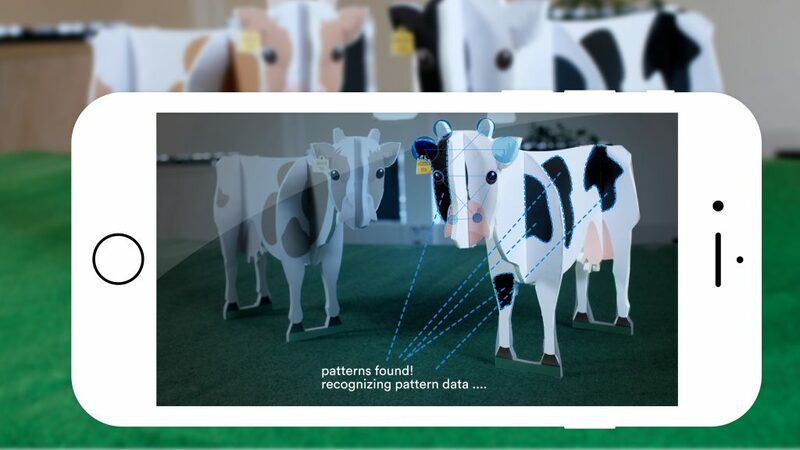 One experiment puts (real time) visual pattern recognition to the test with cows. Recognizing cows in an AR application. This particular experiment could proof very useful for example for authorities tasked with counting the number of hours cows stand in the Dutch meadows. This is done to calculate the subsidies for free-range cattle. So, let’s walk through one of the scripts we want to test. Imagine yourself being a cow-surveyor, walking by a field and pointing your special surveying-app at the cows. Once activated, the App scans the video in real time to find cows. The App knows what cows look like and how to distinguish them from the field, fences, clouds etc.. Also, the system improves itself via machine learning and A.I.. Once new cows are recognized, the app breaks down the patterns on the cow. Think of the color patterns on their fur, eye-nose-ear ratios, body ratios, etc.. Combined, these are unique for every cow. Once the cow is recognized the App delves into various databases and checks on the vitals and other data of the cow, registers it as being outside and then perhaps does some other assessment. This App would of course also involve some AR (Augmented Reality), be it via an AR visor like the Microsoft Holo Lens, or something as simple as an Layar-esque app. Our VR/AR SIG (Virtual Reality/Augmented Reality Special Interest Group) is also looking into real time AR coupled with cloud services. 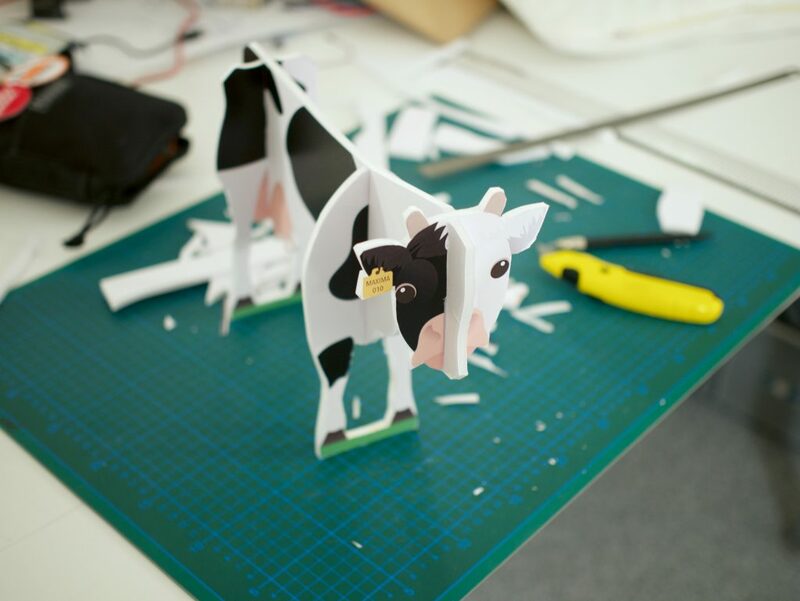 Why use miniature foam board cows? So, why did we pick cows? Well basically, we have not seen any use of pattern recognition besides industrial- and entertainment applications. The reason to pick cows is because they seem an easy target for visual recognition. In the agricultural world, most recognition is done using near field electronics, like tags and implanted chips and we figured this might be done more economically via visual recognition. Finally, we thought it might be more fun and controllable. Cut-out miniature cows are easy to herd into groups and our researchers can also easily test various perspectives and optical circumstances. Besides: our cows are super fun and foldable! This experiment fits right in with the other activities of Mirabeau Labs. For example, we have published articles on chat bots enriched with intent recognition and we tested various new interfaces like Amazons Alexa, Facebook Messenger – powered by chatbot services – and of course Cortana. Up until now, our research indicated that image recognition is reaching maturity quickly. Real world cases seem to be few and far between, so we’re working on that with our partners and clients. Our end game for this research track would be real time video processing and pattern recognition in a real-world application. Mirabeau is pushing the envelope to get hands-on experience with services that can help our clients to combine recognition and data analysis. Ultimately we could also apply them in augmented reality interfaces, like our mock-up images. We like to think that these interfaces and technical opportunities are ready to be applied in common, real-world services of financials, commerce, travel, b2b and in many other places. They also fit into the Internet of Things experiments and exploring new interfaces. Our research team is trying to find out how smart these services are in the real world, what the fault tolerances are and of course what do you need to get started on a manageable scale. For this we developed a test bot that does the required image recognition by using services from cloud providers like AWS, Microsoft Azure, Google, IBM and niche players like Cloudsight and Clarifai. It is very interesting to explore the different outcomes like the number of objects recognized and the reported confidence levels. In the meantime, we are also trying to correlate practical information like functionality, learning capabilities, rate of development with cost of usa, speed and many more criteria. Want to stay posted about AI for your industry?